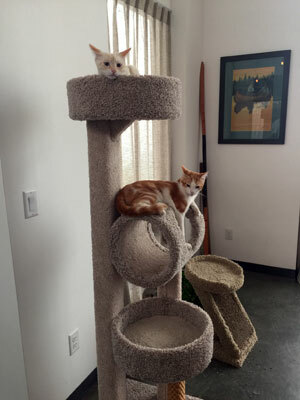 “We changed the kitties’ names from Skittles and Simon to Merry and Pippin. In case you don’t recognize them, Merry (Meredoc Brandybuck) and Pippin (Peregrin Took) are two beloved, best friends and cousin Hobbits in ‘The Lord of the Rings’ by J. R. Tolkien. The names fit them perfectly because Merry and Pippin often get into trouble and they always have fun together. 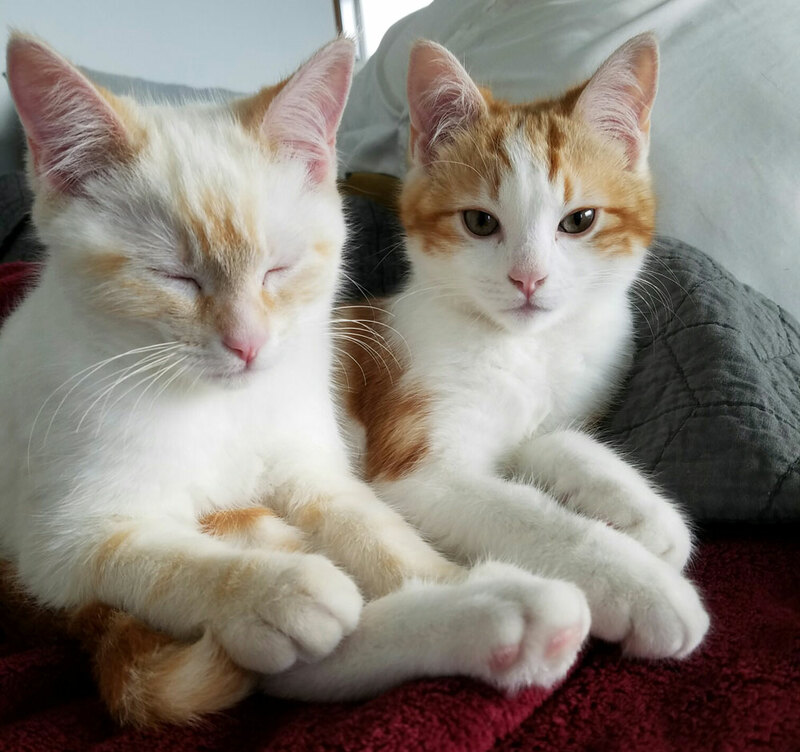 “I’ve never had cats with the markings and colors of these two, and I could tell from their photos that they were full of fun and energy. Plus, when I decided to get another cat (our cat had died a few months before), I wanted two siblings so they could play together and keep each other company. “We laugh at them all the time. They’re very flexible and can stretch their bodies in strange directions. They wrestle, race around the house, chase each other and desperately try to catch houseflies. They lick each other at the same time, attack each other in their cat tunnel and cardboard house, toss their toy mice into the air, and scratch their claws on all of their boards. AND they absolutely adore their toys. Sometimes when I go to the grocery store, I write ‘cat toys’ on my grocery list to keep them well stocked. “Their adjustment to living with us was immediate, and to say that they’re social would be an understatement. We had many guests this summer – often twenty people at a time — and Merry and Pippin would simply walk around and interact with them. I’ve never had cats this relaxed before, and they amazed everyone! “Of our two dogs, the older Sheltie generally keeps to himself — except that Pippin loves him. He loves to lick and rub against him, and while I secretly think the Sheltie likes it, he wouldn’t want our other dog to know. A Lab/Pit bull mix, he’s actually scared of the cats. He may put up with them, but if either one jumps on the bed when he’s on it, he quietly slips off and heads to his crate. They’ve tried playing with his tail too many times for his liking!